The software industry’s attention is riveted on Microsoft today. Software developers from around the world have convened at a conference, called Build, in Anaheim, Calif., where Microsoft will unveil details about Windows 8, the next version of its cash-cow PC operating system. Windows 8 is on course to replace Windows 7 roughly a year from now. This won’t be just another upgrade. Windows 8 is nothing less than the linchpin to Microsoft’s strategy for keeping Windows relevant — if not resurgent — as the shift to the post-PC computing era unfolds. Microsoft declined to comment, preferring to reveal technical details at Build, says Frank X. Shaw, corporate communications vice president. Traditional PCs remain by far the most widely used computing tools out there. The installed base of Windows desktop and laptop computers in use in homes and businesses globally exceeds 807 million and is projected to top 920 million next year, according to market researcher Gartner. Even so, Microsoft has fallen behind as consumers and workers begin to spend more time using touch tablets and smart-phones to work, play and socialize. Sales of smartphones will soar 56%, to 467.6 million, this year, while sales of touch tablets will grow nearly four times, to 69.8 million this year, Gartner says. Internet-connected mobile devices that respond to fingertip touches, instead of a mouse and keyboard or a keypad, are all the rage. The soaring popularity of Apple’s iPhone and iPad touch tablet and Google Android smartphones have, in turn, spawned a burgeoning universe of graphical, touch-enabled software apps. Microsoft, meanwhile, has scrambled to keep up in smart-phones and has been left in the dust on touch tablets. Yet, Windows and the ubiquitous Office clerical suite remain pivotal to the software giant’s future, generating combined revenue of $41.23 billion and operating income of $26.4 billion in Microsoft’s 2011 fiscal year, ending June 30. However, Windows revenue dipped 1% to $4.7 billion in the fourth quarter. For the fiscal year, Windows revenue fell 2% to $19 billion, while Windows operating profit dropped 6% to $12.3 billion. Microsoft’s grand plan is no secret. 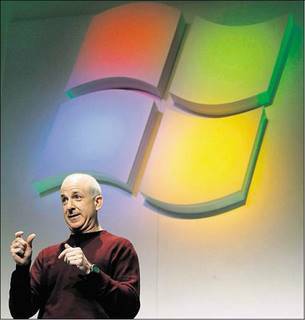 Windows division President Steven Sinofsky confirmed in June that Windows 8 will run on traditional desktops and laptops built around Intel and AMD processing chips. The big breakthrough: It will also run on ARM chips that drive the current generation of touch tablets and smartphones. ARM processing chips are much simpler and require much less power than Intel or AMD chips. They are the key to a Microsoft touch tablet with a long battery life. In fact, arguably the biggest questions Microsoft’s partners, customers and rivals have revolve around how much processing power and battery life a Windows 8 touch tablet — which must run a very long list of Windows processes — will consume, says Michael Cherry, lead operating systems analyst at research firm Directions on Microsoft. Indeed, Microsoft must traverse a minefield of such complexities. But if it succeeds, it could create fresh economic opportunities for the vast global community of Windows-centric application developers, device manufacturers and software resellers, what company officials like to call the Windows ecosystem. The devil is in the details, of course. Windows 8 must run well on disparate hardware: traditional mouse-and-keyboard PCs as well as cutting-edge touch tablets and smartphones. Microsoft has some leeway to get it right. Windows 8 PCs and touch devices need to be compatible with Office and also possess some capacity to run the mountains of older Windows business apps that companies are loath to just toss away, says Al Hilwa, IDC’s director of applications development software. Neither Apple nor Google can do this. And Microsoft has not yet spelled out how Windows 8 will pull this off. Should Microsoft redesign Office to work with a touch interface, for instance, that might be the key to persuading companies to “move to all-Windows-8 PCs and mobile devices,” says Hilwa. First, the company must overcome its culture. It is anything but a simple matter for Micro-soft’s army of product managers to come to a meeting of the minds. They must make the call on which older Windows business apps will work on Windows 8 PCs and touch devices. And they must hammer out how, and when, to integrate Windows smartphones into the new operating system. Yet another daunting conundrum Microsoft must solve has little to do with technical questions or customer relations: It must find some way to grab the cool factor. However, a juicy steak must accompany the sizzle, says Directions on Microsoft analyst Cherry. The earliest Windows 8 would likely become publicly available is the fall of 2012. Though skeptics abound, Microsoft’s partners are quick to point out reasons to be optimistic. Yes, the company remains an also-ran in smartphones — and missed the touch tablet craze entirely. But they point to other advances that are bearing fruit. On Windows 8, a mosaic of interactive tiles will replace the familiar Windows desktop cluttered with static icons as the main way to launch programs. This graphical approach derives from Microsoft Surface technology and from Windows Phone 7’s user interface. And Windows 8 will likely have advanced voice-recognition and motion-sensing capabilities that stem from Xbox Kinect. What’s more, Microsoft has long catered to developers, and this could be an important wild card. The company has won praise for going the extra mile to invite developers to contribute ideas to Windows Phone 7 and Xbox Kinect. As a measure of interest in Windows 8, the Build conference was sold out shortly after it was announced. Another independent app developer, Shaun Walker, chief technical officer of software firm DotNetNuke, says Microsoft lost credibility with Windows Vista, the reviled version of Windows that preceded Windows 7. But he says the company more than made amends with how it handled development and support for Windows 7. The time may be ripe by next fall for Microsoft to persuade thousands of corporate customers still using Windows XP to migrate to Windows 8.